There are 20 times as many American jobs that have been created in the last six months thanks to President Trump’s tariffs on imported foreign goods than jobs that have been lost. Research by a Coalition for a Prosperous America (CPA) finds that the number of U.S. jobs gained because of Trump’s tariffs on imported steel, aluminum, solar panels, and washing machines exceeds the number of U.S. job losses because of the tariffs by a staggering 20-to-1 ratio. 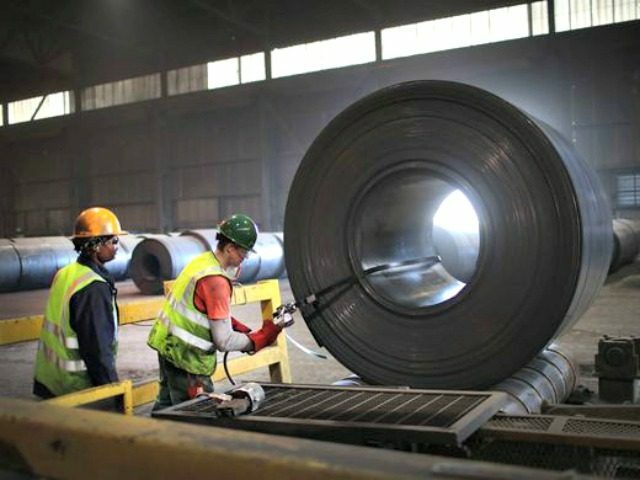 As Breitbart News reported, the CPA research has found that over the last six months, there have been about 11,100 U.S. jobs created due to Trump’s protective tariffs. On the other hand, there have been about 514 job losses directly tied to the tariffs. The most notable increases in job gains due to the tariffs were in the domestic steel and aluminum jobs. In the steel industry, alone, nearly 5,000 manufacturing jobs have been created. In the aluminum industry, a little less than 3,000 manufacturing jobs have been created thanks to Trump’s tariffs. Though Trump’s tariffs have been incredibly popular — specifically with American business owners, U.S. workers, and GOP voters — the Chamber of Commerce, free trade lawmakers, and the billionaire GOP donor Koch brothers have all attempted to stop the job-created tariffs. Since 2001, free trade with China has cost millions of Americans their jobs. Between 2001 and 2015, about 3.4 million U.S. jobs were lost due to the country’s trade deficit with China, as Breitbart News reported.